The decade of 1910-1919 in classical music features a fascinating intersection of compositional styles, ranging from the romantic to the impressionistic to the avant-garde. Violinist Andrea Segar and pianist Miles Graber explore the richly varied repertoire written for violin and piano during this decade in a series of two concerts taking place on October 3rd and November 7th. 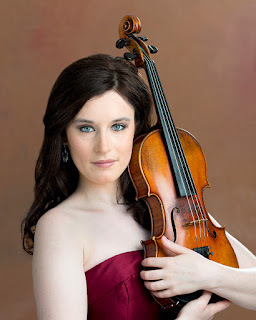 Violinist and Northern California native Andrea Segar has appeared as soloist with orchestras throughout the United States. Her performances have been featured on NPR’s Performance Today and classical music stations nationwide. Andrea's awards include first prizes in the Washington International String Competition and the ASTA National Solo Competition. Her chamber music performances include collaborations with members of the Emerson String Quartet, Roger Tapping and Colin Carr. Andrea's festival appearances include Arizona Musicfest, the Olympic Music Festival, the Birdfoot Festival, the Perlman Music Program, Yellow Barn, Music@Menlo and various festivals in the UK and Mexico. She received her undergraduate and Master of Music degrees from the New England Conservatory, where she served as the teaching assistant to Donald Weilerstein, and on the faculty of the New England Conservatory Preparatory School. Andrea also served as the head violin studio teaching assistant to Soovin Kim and Philip Setzer at SUNY Stony Brook, where she received her Doctor of Musical Arts degree. She currently serves on the faculty of the Young Performers Program at Music@Menlo in Atherton, California.